There is no detailed series of pictures for this idea, because I guess I was running out of time that night. 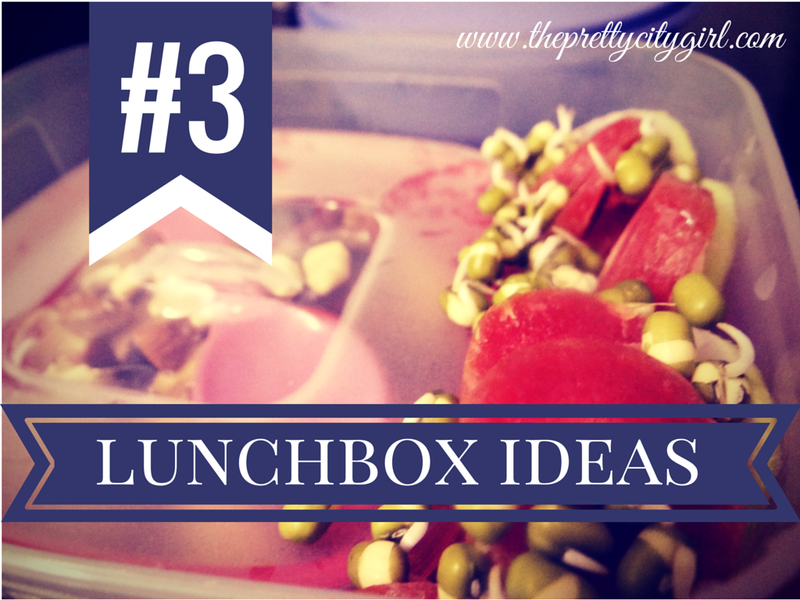 This idea is a full packed healthy one, with no muffins or biscuits whatsoever. Firstly, in a container, I put sliced bananas and pieces of apple. Later, I added pieces of almonds, cashew nuts, and raisins. After that, I poured chocolate sauce on all of it. I also put a small spoon inside the container for the sweet dish. Later, I put that container in a bigger lunchbox. In the little space that was left, I put sprouted moong beans, which are full of fibre and proteins and great for health. I topped them with a little cheese-spread (just for namesake), and then squirted some lemon juice on top of it. Then I put sliced tomatoes, sliced carrots, and sliced cucumbers on top of that. Later, as there was a little more space left, I again added a layer of the sprouted moong beans on top of the slices. This is how the lunchbox looks like towards the end! I also put one small fork for the slices and one more spoon for the moong beans! Have you started carrying lunchbox to college?